Do You Have Investment $$ & A Yes Vote? Are you looking for an investment opportunity? Are you a Yes vote? 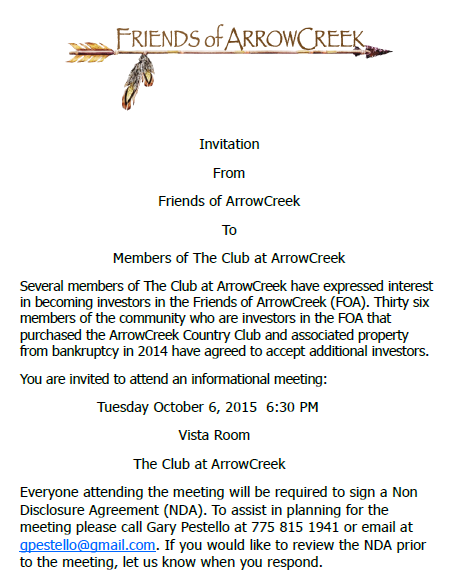 This entry was posted in ArrowCreek, ArrowCreek411, FOA, FOA Letter, Friends of ArrowCreek, Opportunity to Invest and tagged ArrowCreek, ArrowCreek 411, ArrowCreek411, FOA, FOA Invitation, FOA Letter, Opportunity to Invest. Bookmark the permalink. 2 Responses to Do You Have Investment $$ & A Yes Vote? The dirty 3 dozen are getting desperate. Now using the political lobbyist (Pestello) to buy votes. We pay, they play, they go BK. NO! NO!! NO!!! Let’s see if I understand this correctly. Mr. Pestello and his fellow investors seem quite willing to accept a bailout from the vast majority of owners who are steadfastly against subsidizing The Club. But as back up, they are offering Club members an opportunity to invest in the FOA. I suspect that folks, who gladly ponied up $240 a month for unlimited golf, might balk at forking over $10K or more to invest in a no growth business. So, if Club members won’t put their own money where their mouths are, is it a bit disingenuous of them to expect the majority of owners to subsidize their expensive game?